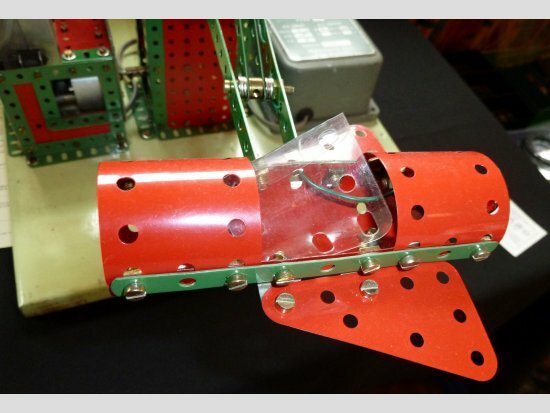 The model, a typical 1960’s shop display model in light red/green probably made to promote the new narrow strips and perhaps build on the excitement created by the space race, is for the McCallum family an iconic model. The model was displayed in the window of Godkins toyshop, in Ripley Derbyshire, when my Dad, Tom, was 12 years old. Every day he passed by the window he admired the gyrating jets. 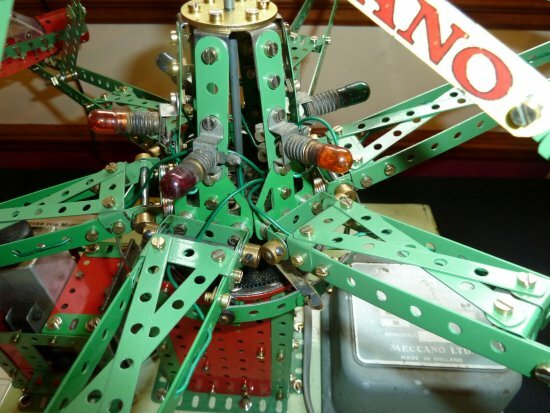 This was the model that started my Dad building in Meccano, (collecting came much later than his 12th birthday). The shop eventually closed, along with many others in 1980`s, and the model along with the residual stock of Meccano disappeared. Who could believe that after 30 years the model could still be in existence but in September 2011 my Dad received a phone call from a man in Derby with a No.10 set for sale. On viewing the set 10, which was purchased, Dad was about to leave when the chap said "Oh, you may as well have this too", pointing to a very old cardboard box. On looking inside my Dad was delighted to see a somewhat dirty dealer display model, the same he had admired as a boy. Enquiring where it came from the chap told how Mr Godkin gave it to him over 20 years ago to restore, but he never got round to it. So the very model that began my Dad's enthusiasm is now on permanent display in our collection and may well spur on another generation of Meccano enthusiasts - my nephew Max is now fascinated by it too. 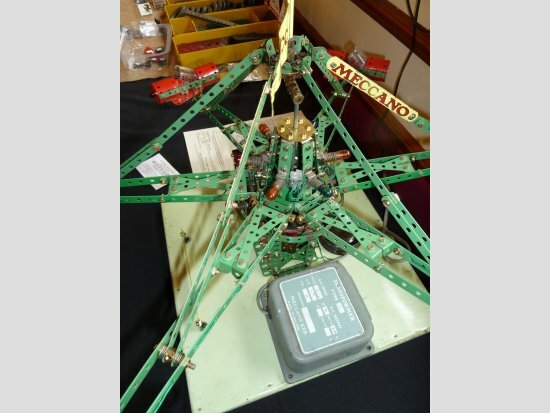 The model was displayed at our March meeting and is a joy to watch as the jets rise and fall. To see a video of in operation click here. 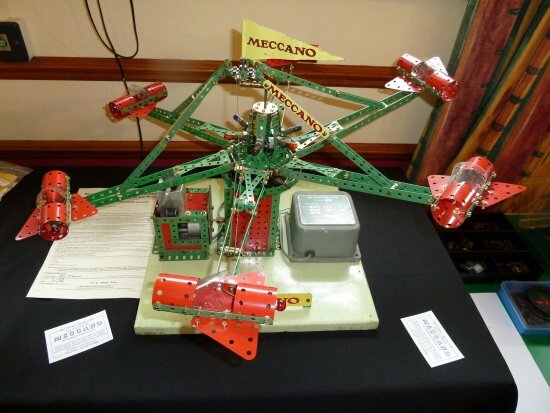 Editor : The model was featured in the June 1966 Meccano Magazine as part of a series of fairground models that had attracted much attention at the 1965 National Model show in London. 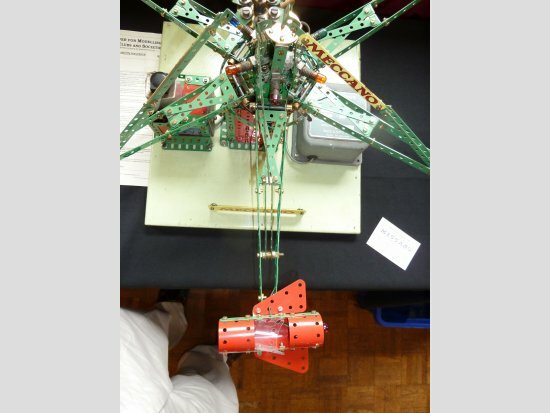 Spanner reports “The display of a miniature fairground included three specially designed large display models, a dive bomber, an Octopus roundabout and a Big Wheel. Since the exhibition Meccano Ltd. has been inundated with requests from readers asking for building instructions for these models ..... " These were provided in the MM. Spanner also comments "looking at the model, you will notice some rather unusual lamp holders. 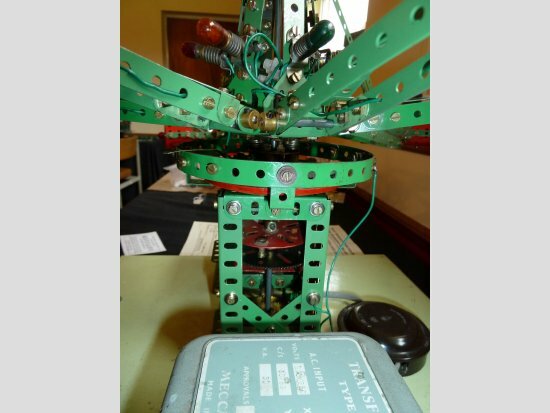 This is because it was designed before the introduction of the Elektrikit when the standard Meccano lamp holders were not in production." The Elektrikit was introduced in May 1963. The lamp holders in the Octopus are typical of those used in dealer display models of the early post war period. The rise and fall mechanism is delightfully simple, caused by the offset rotation of the pivot point for the supports for the octopus arms. (see illustration above from MM).